It was a victory for the AMS Sexual Assault Support Centre (SASC), the Indigenous Committee and student groups — and a bittersweet loss for the AMS — on Friday as all referenda except for the proposed AMS Bylaw changes passed. The SASC and Indigenous Fee referenda both passed, meaning the Sexual Assault Support Fund fee will nearly triple to support the SASC’s expanding operations and a $0.95 Indigenous Student Fund fee will be created. A referendum to reduce the graduating class fee to $3 per year also succeeded and over 90 per cent of students voted in favour of continuing the U-Pass program for another 5 years. However, the AMS Bylaw changes — which would have abolished student court, tightened guidelines for referenda questions and allowed the AMS to limit the release of sensitive records — narrowly missed reaching quorum by 203 ‘yes’ votes. Both questions that were put forward by a student petition — a fee for establishing a thrift shop and a restructuring of the campus culture and performance fee — passed. 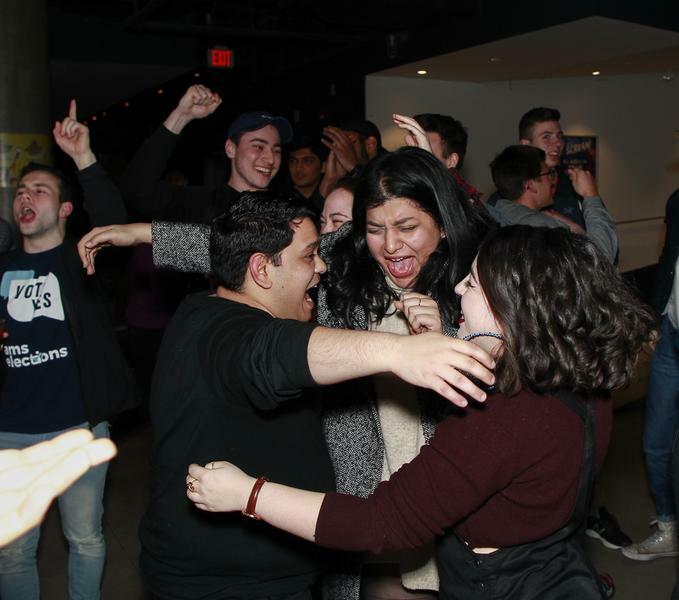 SASC staffer and collective member Niki Najmabadi was thrilled by the result, which she said will allow for the SASC to continue its work on campus and in the UBC community. This follows a contentious year for the SASC, whose support services were nearly cut last year. “Our team is so strong … and we made it through and we did it!” said Najmabadi of the campaign. “And I’m also really happy for survivors knowing they’ll have stability coming in the future years. Indigenous Committee members were “beyond excited” for the support the Indigenous Student Fund which will provide support to Indigenous students and student-run initiatives on campus. “It also sets up the future in the student body being involved in Indigenous events, because we’re going to host cultural events throughout the year,” said Laura Beaudry, a Cree and Métis student member of the Indigenous Committee. Indigenous Committee Members Verukah Poirier-Jewell and Tiana Bone echoed Beaudry’s sentiments. “UBC is going to be home for us now,” said Poirier-Jewell.